Charles Darwin's The Origin of Species (1859) shattered faith in Creation, God, and other fundamental Bible truths for many readers. Since that time Christian scholars have struggled to establish Creation on scientific grounds: first, through scientific creationism and recently through intelligent design. But in so doing they have unwittingly detached the Creation story from the rest of the Bible. Also, by overly focusing on the origin aspect of the Creation story they have obscured its broader spiritual dimensions. Or, to put it differently, they have inadvertently smothered the Word that spoke the universe into existence. While the book of Genesis begins with the creation of the world, it ends with the creation of a nation. In other words, the Creation story "does not stand by itself as though it were a prescientific attempt to explain the origin of the universe." Rather it is prologue to a history-salvation history that begins with the call of Abraham, extends to the Exodus, ancient Israel, the New Testament, and culminates in the creation of "a new heaven and a new earth" (Revelation 21:1). * To be sure, there is a sense in which the experience of redemption preceded the knowledge of Creation. Not only did Moses write Genesis centuries after the Creation, the event that gave birth to ancient Israel and shaped her faith, the event the prophets appealed to in their battle against idolatry, was not the Creation but the Exodus. This appeal to the Exodus is highly instructive. Whereas all the people in the world have their Creation stories–—and evolution is in many ways one—the Exodus is sui generis. It stands alone in religious history. "Ask from one end of the heavens to another. Has anything so great ever happened, or has anything like it ever been heard of? . . . Has any god ever tried to take for himself one nation out of another nation. . . like all the things the Lord did for you in Egypt?" (Deuteronomy 4:32-34). 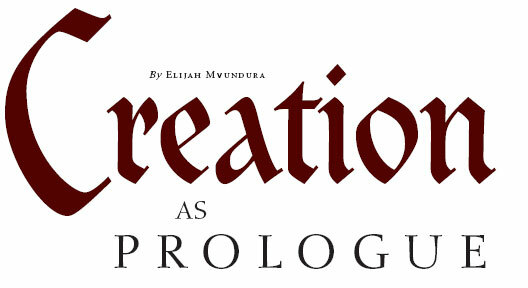 So singular was the Exodus that the prophets equated it with Creation. As Jeremiah 10:16 puts it, "He who is the Portion of Jacob. . . he is the Maker of all things, including Israel." And Isaiah 43:1 described Israel as created, formed, and redeemed by God. This conflation of Creation with a historical redemptive event is unprecedented. It represented a radical break with the religions of antiquity. The ancient gods had a story (mythos) but never a "history." In contrast Yahweh revealed Himself not in the rhythms of nature but in the tempos of history. And by implication He was to be sought or encountered not in nature but in history. Not without significance, the New Testament fixes this revelation in the historical person of Jesus Christ. John 1:1-16 describes Him as the principal agent in Creation and redemption; Colossians 1:15-20, as the center and foundation of the whole creation; and Ephesians 1:9, 10 as the purpose and end of Creation. While Romans 5:12-19 transfers the Creation motif of Adam as head of humanity to Christ, 2 Corinthians 4:6 literally equates Creation with redemption. And then, in a language that clearly echoes the Creation, the angel preaching the eternal gospel in Revelation 14:6, 7 calls on "every nation, tribe, language and people" to fear and worship the God who created "the heavens, the earth, the sea and the springs of water." All in all, in both the Old and New Testaments God's creative acts are not restricted to the creation of the world. Rather, there is an unbroken continuum embracing His redemptive work in human history. Jesus was clearly alluding to this continuum when He declared, "My Father is working until now, and I Myself am working" (John 5:17, NASB).